My first pair of white boots spent most of this summer with me and, come to think of it, the summer before too. Their life sadly came to an end after a particularly raucous Arctic Monkeys gig – a pretty good way to go out you could say. After losing them to Manchester Arena’s mucky floor, I truly noticed the absence of my WAB’s (White Ankle Boots) when getting ready in a morning. I had never realised how much I relied on them to transform a boring weekend outfit or, at the other end of the spectrum, complement a statement get-up. 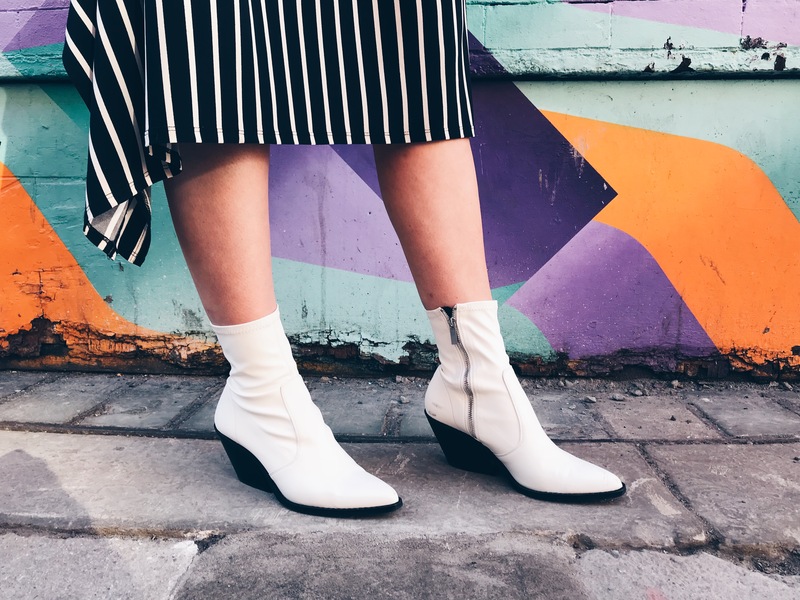 Acting as both a blank canvas and a sartorial talking point, you can slip on a white boot with 99% of your wardrobe and it is guaranteed to work. Incredible paired with any shade of denim, print or colour, they’ll add a clean and minimal edge to your ensembles without trying too hard. A boot charged with a certain element of futurism, they contrastingly hail back to the retro days of the swinging Sixties. 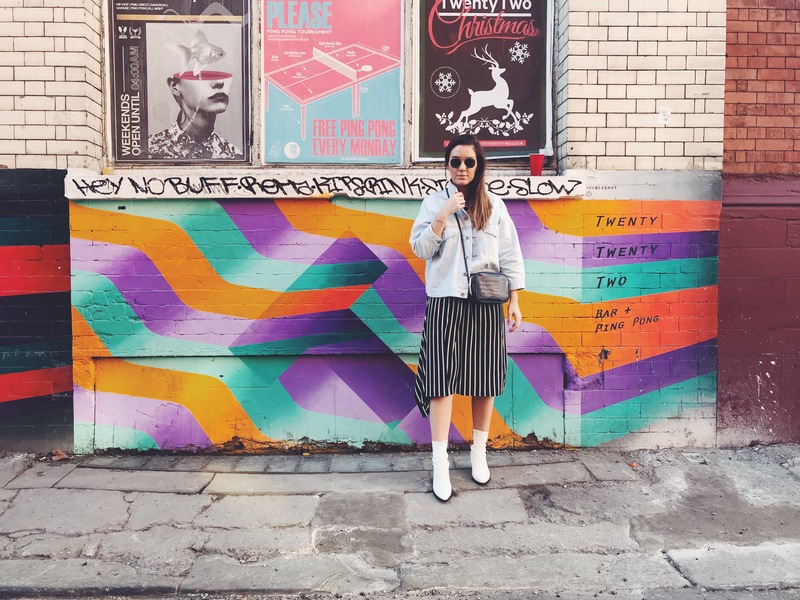 This season, however, white boots provide an injection of serenity and minimalism in between AW18’s bright doses of colour – rather akin to this vibrant wall I found in Manchester’s Northern Quarter, this week. After experiencing many withdrawal symptoms, replacing my white boots became a necessity. I knew I wanted a low heel and a pair I could wear with both trousers and skirts – a necessity to get maximum wear out of your pearly booties. After being inspired by Wears It At Kat, I opted for Topshop’s Mission boots. Boasting a sock design, the boot zips tight and hugs your ankle for a flattering look that suits a floaty midi dress as well as a tailored pant. Its asymmetric slanted heel is evidently inspired by Céline’s rodeo boot (RIP) for a subtle nod to the recent western trend which, I am happy to note, seems to be in it for the long run. It’s safe to say that white boots require a little more TLC than your average black pair. Friends often ask me whether it’s a nightmare to keep them clean. My answer is always the same – they’re not as high maintenance as you would think. Stay clear of muddy puddles and grimy Arctic Monkeys gigs and they’re bound to last your journeys without any scuffs. You may need to wipe them every now and then but I wouldn’t exactly call that labour intensive. As long as you choose leather, you can invest in a decent white polish if they do need a spruce up. The look I’m wearing in these shots is very typical as to how I’d style my white boots for every day. Simple colour palette, classic stripes and a timeless denim jacket. The length of this Topshop dress is perfect for me as it hangs just below the knee and boasts an asymmetric hem for a bit of edge. Bare legs in October is more than okay if you balance it out with a jacket on top – heightened with these Mission boots as they zip up rather tall above the ankle. If I’d worn this outfit with a black boot, it just wouldn’t emit the same ‘pop’ as the white offers. If you’re a WAB convert, you can most likely relate to this – everything looks dull in comparison. Although this may be something I won’t choose to wear in a few years time, white boots are currently a wardrobe piece I am more than happy to invest in. If you decide to venture to the white side too, just remember – they do not like gig floors. Previous PostThe Big Sleeve Style Saga: Why are we so obsessed?